On Tuesday, October 16, 2012, LCA's Chris DeRose, was again invited by Rupert Murdoch to speak at News Corporation's Annual General Meeting (AGM) at 20th Century Fox Studios in Los Angeles, CA. DeRose thanked Mr. Murdoch for "being a man of his word” in delivering the press coverage he promised at the 2011 AGM. (News Corp ran eight opinion editorials during 2012 in the Australian press on the live export issue). DeRose asked Murdoch for continued media coverage in Australia in addition to US and European media, stating, "change only occurs through an informed public.” LCA is committed to following through with Mr. Murdoch and News Corp to expand coverage internationally. Watch Philip Wollen speak in Adelaide at Ban Live Export rally. Chris DeRose says "One of the best talks I ever heard. This well-to-do mans' dream is to die broke. He wants to see “real change” for animals in the world." Sheep have their throats cut while fully conscious and then are skinned on the spot in Kuwait slaughter yard (Photo: Animals Australia)The invitation and audience DeRose was given to attend News Corp's AGM in October 2011 was unprecedented. DeRose had almost five minutes of Murdoch’s undivided attention to speak about the cruel and inhumane live animal export business. Listen to the audio. During the meeting DeRose was able to persuade Murdoch to condemn Australia’s live animal export and promise to provide a forum for a fair and impartial voice through News Corporation’s media outlets. Murdoch has begun to make good on those promises. On February 25, 2012 an Op Ed appeared in The Australian, a News Corporation publication, Australia’s “most influential and prestigious” and only national daily newspaper, equivalent to The Wall Street Journal and The New York Times. An Op Ed (an abbreviated term for “opposite the editorial page”) is reserved for fact-based editorials written by industry leaders not affiliated with the particular publication’s editorial board. The Op Ed, which can be viewed as a PDF here (or online with a subscription here), has garnered overwhelming praise from the Australian people. “It clearly sums up the shame and anguish I feel. Almost 100% of politicians do nothing to improve the welfare of animals and are clearly more interested in feeding the greed of the industries they support. It is heartening to know that the rest of the world is watching and that our shame is perceived as scandalous on an international level,” wrote one reader. Other opinion pieces condemning the Live Animal Export trade appeared Australia's leading newspapers, The Herald Sun and The Courier-Mail. The articles appeared on Wednesday, April 4, 2012 and reached nearly 1.5 million people. The Ban Live Animal Export movement in Australia continues to use demonstrations, letter writing and petition campaigns, and a YouTube virtual protest campaign to speak out against live animal export. After an investigative news report was shown on Australian television exposing the horrors of live animal export over 100,000 emails were sent to Prime Minister Julia Gillard in the first 24-hours after the program aired. In fact, the Ban Live Animal Export petition is now the largest in Australia’s history. Australian’s are calling on their government to ban live animal exports until importing countries adopt animal welfare standards. Most of the importing countries have no animal welfare standards and the animals shipped live are subject to atrocious cruelty and abuse from the instant they are packed onto the ships to the last terror-filled final moments of their lives. The most effective way to force importing countries to improve their animal welfare standards is to stand with the Australian public and call for an immediate ban on live animal export. This will convey a message to importing countries and politicians that compassionate people everywhere will not stand for animal cruelty. Media Mogul Rupert Murdoch Condemns Australia's Live Animal Export at News Corp's AGM at Last Chance for Animals' Urging! 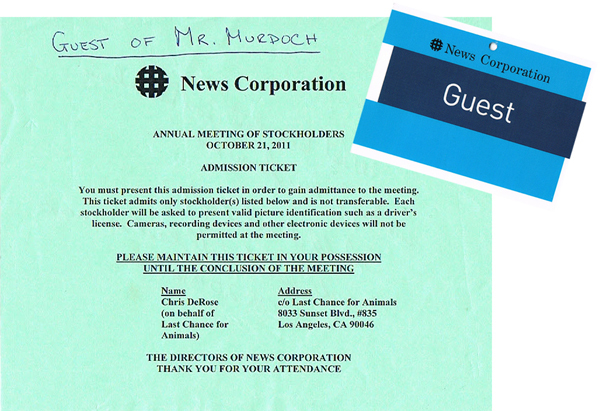 On Friday, October 21, 2011, Chris DeRose, president and founder of Last Chance for Animals (LCA), was the only guest (non-shareholder or media), invited by Rupert Murdoch himself, to attend the News Corporation's Annual General Meeting. - Will you condemn Australia's live animal export? - Will News Corporation allow a forum for a fair and impartial voice through your media outlets? - Can I have a contact person to talk to so that we can get that kind of dialog going in Australia? DeRose also added, "You're the one single individual who can make a difference on the issue." 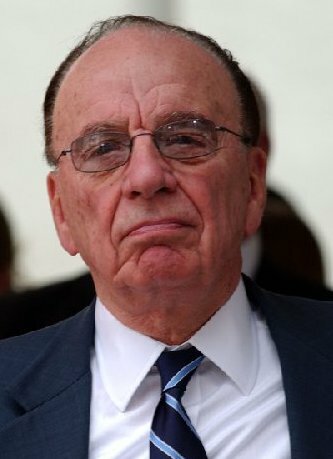 Rupert Murdoch, an Australian-American global media tycoon, is the major shareholder, Chairman, and Managing Director of the media conglomerate News Corporation. LCA's position is that some of the papers owned by News Corporation print defamatory and inaccurate stories that are anti-animal and anti-activist, particularly on the issue of live animal export. Murdoch is a powerful man whose voice could end the unnecessary suffering of millions of animals. LCA would like to thank Rupert Murdoch for his compassionate choice to condemn Australia's live animal export. The fight for the animals is just beginning; LCA will make sure Murdoch keeps his word!